Substituting butter for oil in brownie mix adds complexity and character to an otherwise predictable result. Brownie mixes give you a lot of latitude when it comes to fat substitutions. They contain enough stabilizers and emulsifiers to make them nearly foolproof, but you have to accommodate for their sodium content by using unsalted butter. Butter's flavor gives it the advantage over neutral vegetable oil and you can take it a step further by cooking the butter to the beurre-noisette, or brown-butter, stage. Substituting with butter doesn't affect baking times or temperature -- only taste and texture. Melt 6 1/2 tablespoons of butter in a heavy-bottomed saucepan over medium heat for every three-quarters of a cup of oil called for in the brownie mix's directions. One stick of butter comprises 8 tablespoons, so use the graduated scale on the butter wrapper to help you measure. Stir the butter frequently as it heats and cook it until the solids caramelize. Butter develops a toasted nutty aroma and a brown color when it reaches the buerre-noisette stage. Take the butter off the heat and let it cool for a few minutes, stirring occasionally as it cools. Add the butter to a mixing bowl along with the brownie mix and water. Stir, then add in the eggs. 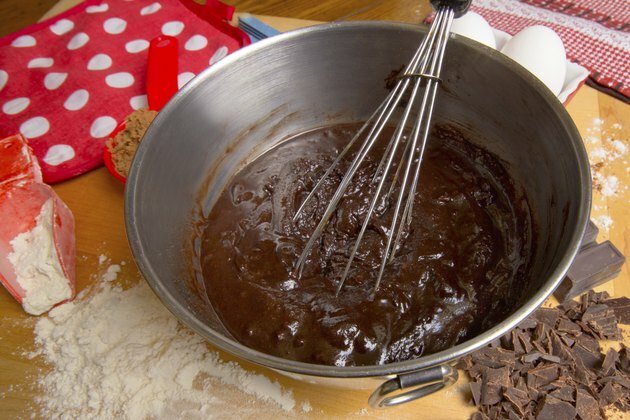 Mix the batter and bake the brownies according to the mix's directions. You can substitute butter for vegetable oil in cake and brownie mixes, but not the other way around.